We now offer Shiny Custom Metallic Foil Seals in Gold, Silver, Red, Green and Blue. These metallic shiny seals are fused directly to the diploma paper, completely customizable and can be added to any order. 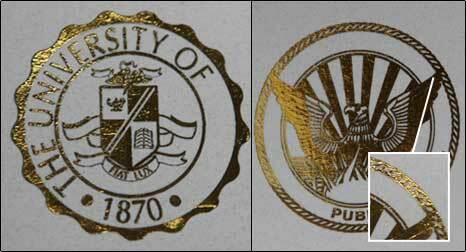 To order a shiny custom metallic foil seal with your order just select "Shiny Custom Metallic Seal" for the Diploma or Transcript Seal option on our College or High School order forms. Remember: There is no delay for this option. Our custom metallic seal orders are still shipped the same day. We are the original Next Day Diplomas.